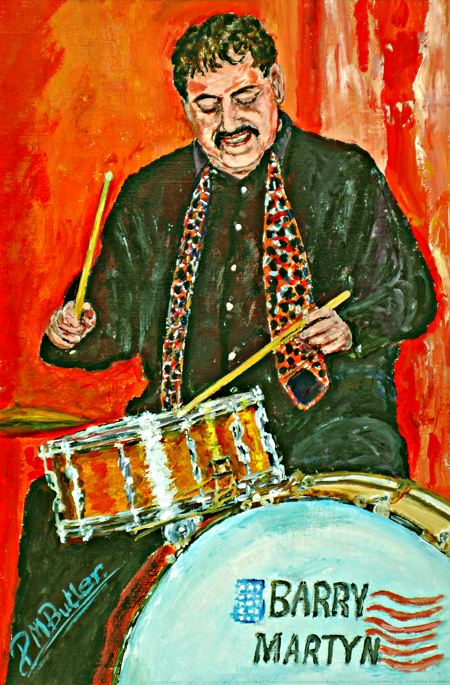 Jazz Portrait of New Orleans based jazz great Barry Martyn in characteristic form on drums with his Young Bloods at The 100 Club in Oxford Street in February, 2010. Born in London, Barry moved to the USA in the early 1960s and has been a key figure in the revival of New Orleans Jazz since 1984. Barry studied drums with Cie Frazier, appeared in sessions with Barney Bigard, and as has frequently been the youngest member in the bands which he has led. He toured Europe with New Orleans giants of jazz including George Lewis, Albert Nicholas, Louis Nelson, Captain John Handy and Percy Humphrey. During an interlude in Los Angeles in 1972 he founded the Legends of Jazz ensemble, making several worldwide tours and recording extensively. As a jazz historian Barry has collaborated in reissuing back catalogues and has researched and published books such as “New Orleans Jazz The End of the Beginning” and his latest work, “Walking with Legends: Barry Martyn’s New Orleans Jazz Odyssey”. Barry has since written to me encouraging me to “keep doing what you are doing”. Thank you, Barry, for being so supportive of my jazz portraits. I was sad to hear you may no longer be touring London and the UK. But in your sons Emile and Ben Martyn and their band “The Fallen Heroes” your UK legacy lives on. 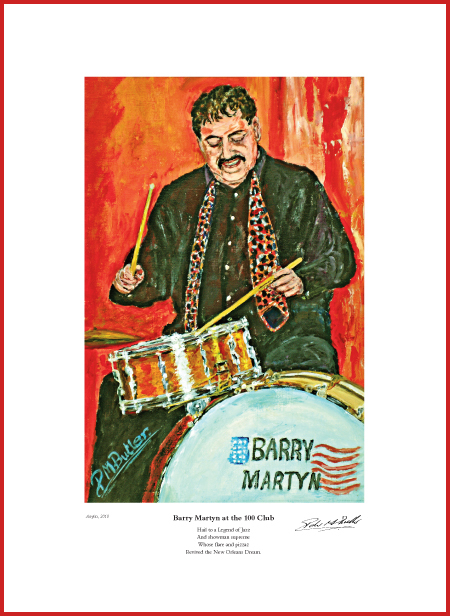 Fine Art Print of the Jazz Portrait of Barry Martyn.